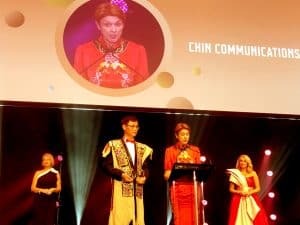 On the awards stage twice in two days, tonight in Melbourne, Chin Communications was Winner in the Melbourne Awards, the city’s highest accolade celebrating the inspirational achievements of people and organisations. 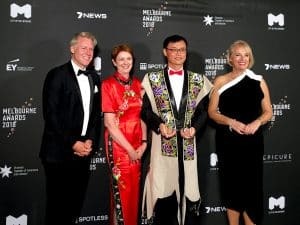 Last year Chin was the Runner-Up and this year we’ve gone one better in our Contribution to Multiculturalism in Melbourne. Work for the City of Melbourne in its 35 year Sister City relationship with Tianjin delivering many projects for Melbourne businesses including in football, the arts and biotechnology. The MSO and Australian Ballet in successful tours to China and performances like the MSO Chinese New Year Concert – the grandest one outside China itself. The Shrine of Remembrance and the Chinese Museum telling stories of our history in Chinese Translation. The China-Australia Free Trade Agreement and Belt and Road Initiative delivering business opportunities to us in Melbourne. Victoria’s Skilled Migration program attracting skilled migrants to our state from all over the world. Melbourne’s tourism venues and our education institutions, our businesses and governments are all welcoming international visitors, investors and migrants – it’s not only about Chinese for us, Chin works in up to 50 languages whether Arabic or Vietnamese, Indonesian or Russian – we create iconic brands for wines, we help companies secure investment and we bring understanding and colour to major events like the Spring Racing Carnival. Whether telling stories about indigenous art or translating paddock to plate agribusiness, language and culture are central – you need to get this right to succeed. In accepting the award, CEO, Kate Ritchie, paid tribute to the Chin Communications Team and also called out Trump, who is turning migrants away, contrasting this with Melbourne which is made even greater through migration and multiculturalism. Chin Communications has operated in Melbourne CBD since 1992. Chin has been delivering Chinese Translation services for over 25 years and is widely regarded as one of the leading Chinese communications specialists in the region. In addition to Chinese, Chin regularly supports up to 50 other languages in the community and business. On Friday night in Adelaide Chin’s Interpreting Team received the industry’s highest honour for its work with the Australia and New Zealand School of Government and the high-level training program delivered to Chinese leaders in Simultaneous Interpreting mode. The Australian Institute of Interpreters and Translators’ Excellence in Interpreting Award.